Air Force brass on Wednesday defended their decision to spare nuclear-arms personnel from the force cutbacks happening in other parts of the service. The Air Force announced in June that it had decided to retain 4,000 airmen working in the nuclear mission who would otherwise have faced possible involuntary separation from the service. 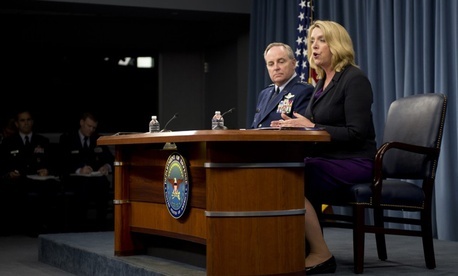 In explaining the decision, Air Force Secretary Deborah Lee James said it wasnecessary to have "full manning in our nuclear positions" because of the "vital importance of this mission." Earlier this spring, the secretary told the Air Force Times that due to budget constraints the service intended to reduce its active-duty force by 16,700 personnel in the next fiscal year. At a Pentagon press conference, James said it was necessary for the Air Force to prioritize its missions. "Nuclear is number one. And people need to understand that," she was quoted as saying in an official transcript. The Air Force this year has publicly shown more concern for its strategic deterrence mission, after a number of scandals highlighted low morale and a lack of professionalism by some airmen assigned to maintain, operate and protect the service's arsenal of strategic nuclear-tipped missiles. Official investigations and independent analysis of the problem concluded that a number of missileers perceived that the nuclear arms mission had become a lower priority for service leaders, as evidenced, for example, by the lack of attention being given to their degrading support infrastructure. "We're shifting resources and we're shifting personnel," James said on Wednesday. "The personnel aren't all there on station yet, but they'll be coming." The Air Force in June said it was redirecting $50 million in fiscal 2014 funds toward the immediate rehabilitation of the infrastructure that nuclear airmen rely on. The money also would help to address certain "people issues," according to the service.